So, I’ve made it home from Market and I am slowly recovering. I have to admit that Market takes a hell of a lot out of me; it is an exhausting marathon (mostly fabulous) on its own, but add in a chronic illness and it can just beat you up. But… It is totally worth it. And one of the biggest reason is the people, and this year I couldn’t have even made it to Market without the help of a lot of wonderful and generous people. I am generally loathe to ask for help, but with two collections to present at Market there was no way I was going to make it without a lot of support. So today I want to highlight all of the people who made Market possible. And then there are Audrie and Shelly. 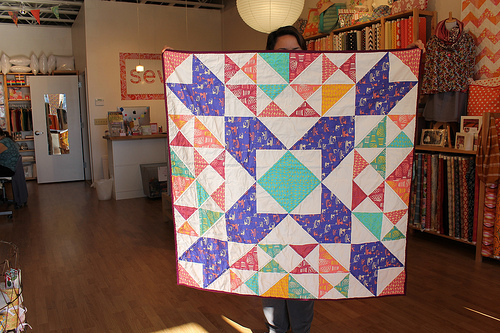 Audrie pieced this quilt to perfection and Shelly quilted it beautifully. 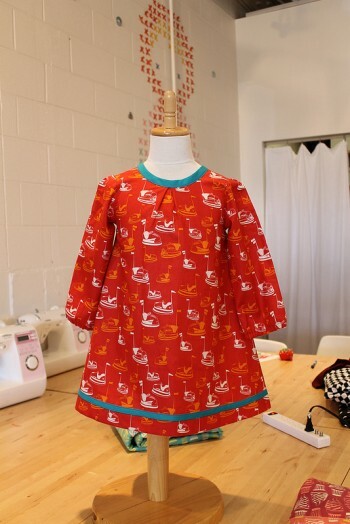 Trish released the pattern at Market, so hit up your local shop to carry it, or check out her Where to Buy page to find someone who already carries her patterns. And then, last but certainly not least, is Rachel of ImagineGnats fame. Rachel stepped up at the very, very last minute as I got my sample yardage for Asbury with just over a week to go before Market. 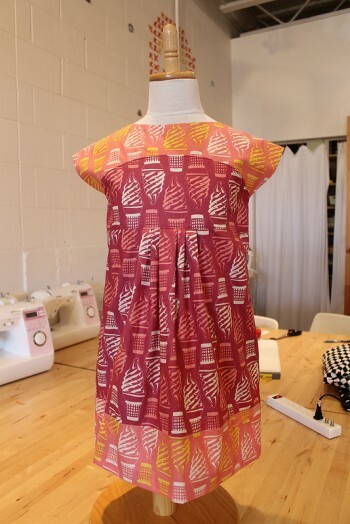 Even with a bit of a shipping SNAFU she managed to pull off two fantastic dresses for Bee and a wonderful quilt (a gigantic block of her devising). And then for added details of awesome, she used the Frippery peacocks to line the bodice, and then more Frippery for the pockets. Did I mention that she had about a day to make two dresses??? And for an added detail, she rummaged up a B button for Bee. I love details!!! Go check out Rachel’s blog to read more about all of these projects. And please go read the blogs of all the people who pitched in with their talents, their time, and their generosity to make my Market possible. I am so profoundly grateful for all of the help. You all completely rock!!! This entry was posted in general and tagged Asbury, friends, Frippery, quilt market. Bookmark the permalink. I…I am speechless…Thomas? The skirt…I’m not sure what to say. That is too funny!! You are a very brave man. 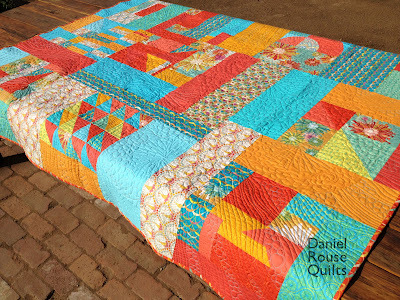 Everything looks amazing but I have to say, that freaking quilt by Daniel Rouse is RIDICULOUS!! 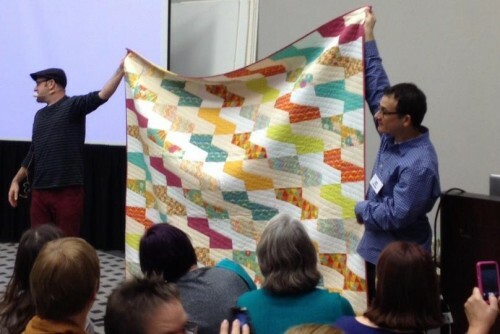 That is stunning, amazing – hands down, best modern quilt I’ve seen. Love it! Your bag was a huge hit, and looked incredible!!! You made Frippery look so good; I can’t thank you enough. Looks like you had fun. I think the skirt was a fabulous idea. I can’t think of a better way to draw attention to your area of the booth. 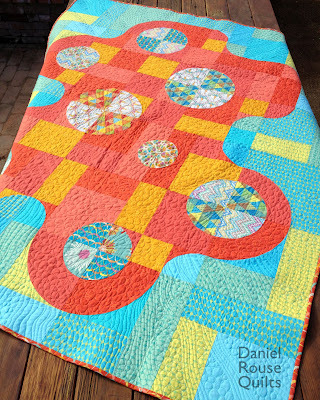 The quilts are wonderful. Hope all your efforts were worth the effort. It was my absolute pleasure to piece that for you 🙂 And I think a poster-sized picture of you in that skirt needs to be hung somewhere HAHAHAHA!!! 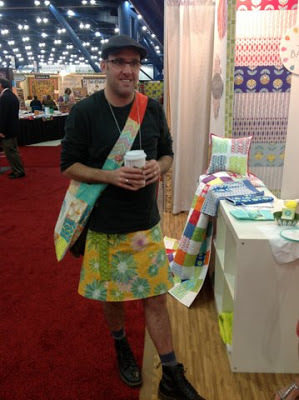 Truly a memorable post Thomas…from fabulous quilts and dresses to the picture of you in the skirt. 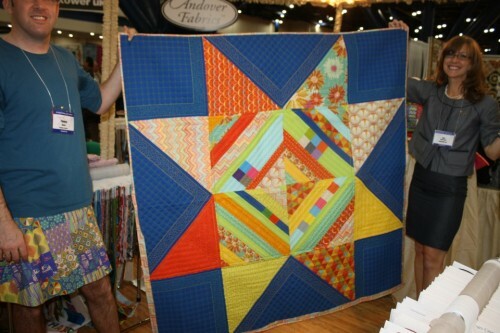 Aren’t quilters just the best! Oh….almost most important, your fabrics are so exciting, I have got piles awaiting me! Great thank you post! 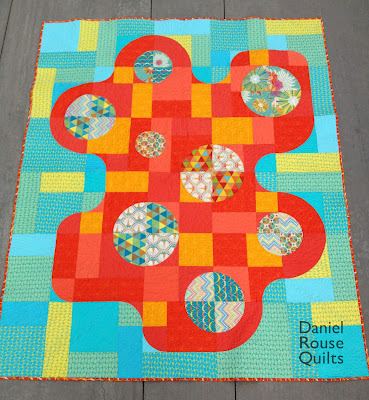 My friend Shelly did some awesome quilting for you. What a fabulous bunch of stuff. 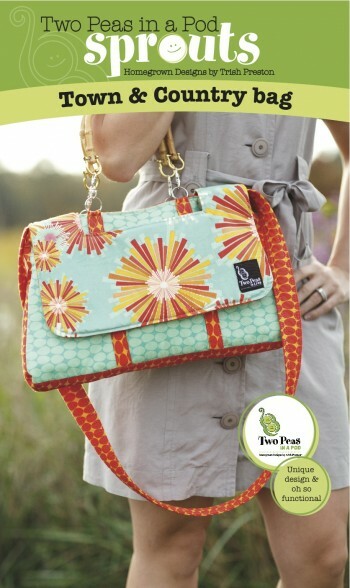 Love the quilts, the handbag, and the dresses, too. 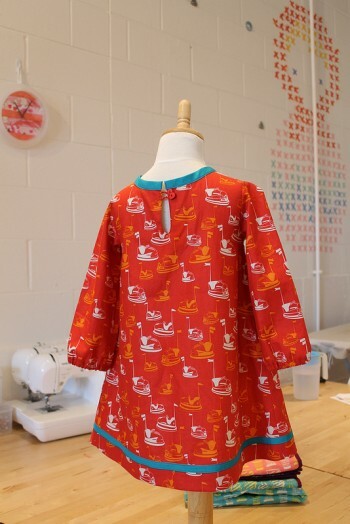 Your daughter is one lucky girl to get those adorable dresses that Rachael made. 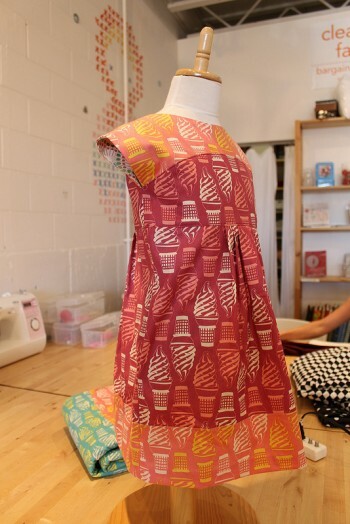 Can’t wait to see some of your new fabric in person. I hope my local shop will carry it! Rachael @ imaginegnats is awesome sauce!!! She is one of my favorite people. Go glad she helped you out.